Here are some of the cars I have owned or helped build. Here are the cars I now own and am building. This 1968 Charger was an ambitious project. It started life as a plain Jane Charger. From there we cut the car apart until it was just a shell. We then cut up a 2007 SRT8 Magnum and grafted the '68 Charger body onto the '07 chassis. With over 2000 hours of work invested the results were worth the effort. 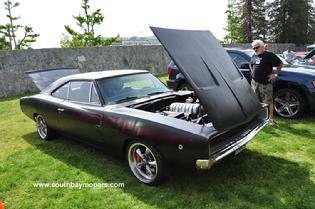 The car runs and drives like a new car but has the style and lines of the classic Charger. Here is my 1955 Dodge Truck. This truck has been through many changes since I started with a 440 then a supercharged 440, moved up to a 528 supercharged Hemi, then a 5.7 Hemi and now a 6.1L SRT8 Hemi. Projects I have been a part of. This is my friend Rob's 1969 Cuda. When I met Rob he had a mild built 340 in his Cuda. His goal for this car was to install a modern Hemi and make it a reliable daily driver with modern technology. This was the first leap we made using modern engine systems in a classic Mopar and has been featured in several magazines. The build of this car was a lot of fun with several friends lending talent to the project. Here is my friend Doug's 1965 Dodge Dart. When Doug's fiance, Mellisa bought this Dart for Doug, it was completely stock with a 6 cylinder. Doug then bought the 340 from Rob's Cuda, an 8 1/4 rear axle and big bolt pattern disc brakes from a 73 Duster. We installed all of these along with TTI headers. Click on photo for more images! 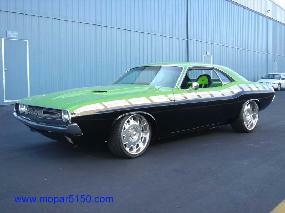 This is the 1971 Dodge Challenger that was featured on the popular TV show Overhaulin. I was fortunate to be selected to join the build team on this eposode. I was part of the crew that built the engine and installed it. After the show was over I remained freinds with the cars owners James and Stephanie. James was looking to make some additions to the car after the show was over. 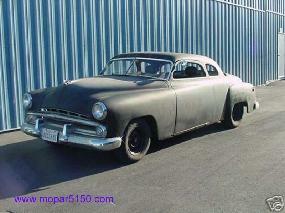 Here is my 1951 Dodge Coronet that I have since sold. This car was my first experiment of modern technology into an older car. I first installed a freshly warmed over 440 for the power. Then I got a modern Chrysler Concorde and used the entire dash assembly,wiring and seats for the interior. The perfect blend of modern comfort with classic styling. My friend Joe was the first of my friends to install a modern drivetrain into an older body style. I helped Joe retrofit and wire a modern 454 into his 1967 Chevy Chevelle. While not a Mopar, this was still a challenging and exciting project to be a part of. Here on John's 1969 Charger, I made my 1st custom aluminum dashboard along with many other fabricated parts.